A HUGE Estate Diamond ring with EGL USA Certified 4.63CT OVAL Center Diamond in F color I1 clarity. The Diamond is Colorless and so Brilliant that you might not notice some imperfections that it has! 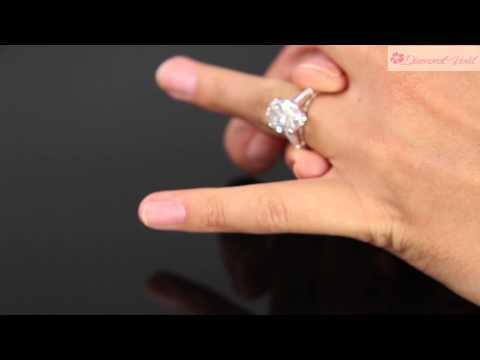 The measurements of the Diamond are 12.68x8.99x5.91 mm. The Diamond ALONE was appraised for over $43K! It is set with 2 Large Long baguettes, estimated total weight is 0.58ct, F-G color, VS-SI clarity. The Platinum Mounting (traces of a stamp 1970-possibly the time it's been made) weight is 4.72 grams, Solid. The band tapers from 3.55mm to 1.43mm on the bottom. Good Estate condition, minor evidence of wear in a form of small nicks and dents to the metal, Polished, ready to wear.